Dubai World Trade Centre (DWTC) will host more than 60 exhibitions, conferences and live events from October to December this year, attracting an estimated 820,000 visitors. Returning to the UAE among these are GITEX Shopper, GITEX Technology Week, Gulfood Manufacturing, Big 5 and Dubai International Motor Show, in addition to a plethora of events catering to a range of industries. GITEX Shopper, the region’s biggest consumer electronics event marked its 25th anniversary this October. GITEX Technology Week, now in its 35th edition, is the most widely recognised and annually anticipated information and communications technology (ICT) trade event across the Middle East, Africa, and South Asia. The end of October brought the Middle East’s mighty food service industry to the forefront, currently valued at $35 billion, with concurrent events Gulfood Manufacturing, The Specialty Food Show, Sweets and Snacks Middle East, and SEAFEX running from October 27 to 29. 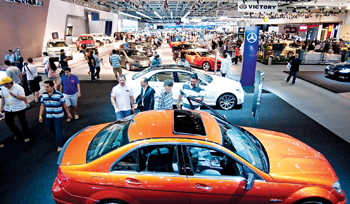 Underlining its position as the most influential automotive event in the Middle East, the 13th Dubai International Motor Show will return from November 10 to 14, showcasing global launches, the latest in car designs, driving technology tuning tips, custom gear, as well as exciting consumer activations. Held every two years, the event has received unprecedented interest from leading names in the automotive world, as well as an influx of new exhibitors resulting in a 23 per cent expansion in floor space this year. Also taking place in November is The Big 5, which will run from November 23 to 26. For over 35 years, The Big 5 has established its position as the largest trade exhibition in the Middle East for construction products and materials. The event last year welcomed over 2,800 exhibitors from over 60 countries, and attracted over 80,000 industry professionals.